Jean–Jacques Rousseau was a gifted prankster; he was an even better conman. Upon navigating the long list of pranks and cons the philosopher from Geneva admits to in his autobiography, Confessions, it’s difficult to not look at his celebrated, and highly influential, social and political works (Discourse on the Arts & Sciences, The Social Contract, etc.) in a mischievous light. In Confessions, Rousseau often refers to his numerous misdeeds as “misdemeanors.” These “crimes” are so damning that, when read through this lens, his more serious works appear to be “felonies.” Was The Social Contract Rousseau’s biggest prank? The state of nature a well-crafted con? Probably not. But this is a man who sent all five of his children away to orphanages, and also wrote a book, Emilie: or, on Education, about the proper way to educate a child. This is a man who, when a friend he greatly respected purchased for him a ticket to an opera, snuck away during the commotion in the lobby of the amphitheater, ran back to the box office and refunded the ticket. He took the money and ran. Of the incident, he wrote, “There are moments when a man is seized by a sort of madness and should not be judged by his actions.” He loved providing these little justifications. His first prank, executed when he was a tween, involved taking a piss in a neighbor’s kettle. Looking back on the incident as an adult, Rousseau wrote, “This memory still makes me laugh.” Did poor Madam Clot, whom Rousseau called “the grumpiest old woman I ever knew in my life,” consume Jean-Jacques’s piss? It’s unclear. But Rousseau clearly felt no remorse, no regret. Other times he did feel regret. For instance, the time he stole a ribbon belonging to Madam de Vercillis — a woman who took Rousseau under her wing, and with whom he was living — after she died. When caught with the ribbon, he blamed the theft on a poor young girl, Maurienne, the house cook. She was fired. Many years later, he wrote, “At times I am so troubled by this cruel memory, and so distressed, that I lie sleepless in my bed, imagining the poor girl advancing towards me to reproach me for my crime as though I had committed it only yesterday.” A few paragraphs later, he determined that, in spite of the terrible consequences for Maurienne, perhaps his actions weren’t so bad because the event eventually made him a better person. Rousseau did not become a better person. And then there was the time Rousseau abandoned a friend in the middle of the street after the friend had a seizure. “He was abandoned by the one friend on whom he ought to have been able to count,” wrote Rousseau. Did the friend die? Rousseau didn’t stick around to find out. So it only made sense that when Rousseau traveled alone to Lausanne (after abandoning his friend in the road), he would tell the townspeople that his name was “Venture of Lausanne.” He decided to, as he put it, “Venturize myself.” He switched the name up a bit, making an anagram of his own: He became Vaussore de Villeneuve, a famous composer from Paris. And, for some reason, everyone in the town believed his lie. A man named Monsieur de Treytorrens invited Rousseau to compose a piece and have it performed at his home by a local ensemble. 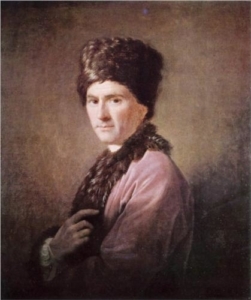 Rousseau spent two weeks writing the music―stealing a melody he had learned from Venture―and one night the ensemble convened for the concert. Acting as the conductor, Rousseau signaled for the music to begin. “Never since the first days of French opera, never in all the world, has such a cacophony been heard,” Rousseau wrote of the performance. It was awful. Everyone laughed. “It was beyond endurance!” said one audience member. “What insane music!” exclaimed another. Elliott Sharp is a freelance writer living in Philadelphia. His work has been published by Village Voice, Philadelphia City Paper, Philadelphia Weekly, and The A.V. Club, among others. Follow him on Twitter @elliottsharp.